- 【Perfect Match】: It can be used with KOBWA Video Doorbells. Plug the doorbell into the socket. When you press the video doorbell, the room will ring and ring, and you will be fully loyal to your home safety. - 【Two-Way Audio and Night Vision】: Communicate with visitors via two-way audio with noise cancellation microphone, you can always monitor your front door by watching real-time videos on cellphone at anywhere. Infrared LED's allow you to record footage, even in dim lighting, you also can see and speak with visitors. - 【Motion detection】: Real-time alerts, 166 Degree Wide Angle Lens, 720 HD video, remote wake-up. Capture the photos or video clips at anytime and store in your phone or sandisk card instead of cloud storage. 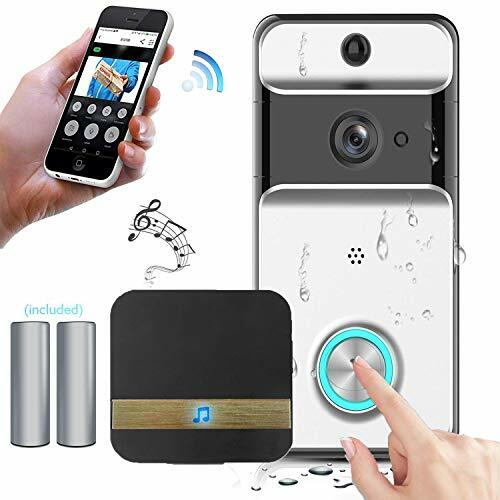 - 【IP53 Waterproof and Lower Power】: The smart doorbell supports multi-device connection Android, IOS, Windows. Waterproof design and adopting ultra rechargeable 5200mah battery, whose standby time more than 8 moths. - 【Multi-Function Door Chime】: 52 ringtones are arbitrarily selected, the volume is adjustable.the wireless receiving distance reaches 100 meters and penetrating. Anti-harassment design, can also prevent serial ringing and doorbell plug and play.